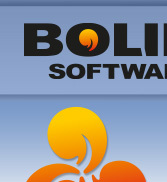 The only cataloging software you'll ever need. 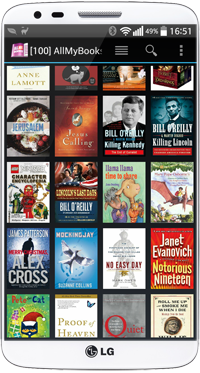 All My Books helps you archive, organize and track your collection through an easy to use, flexible interface. 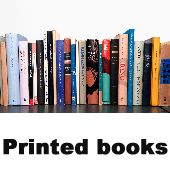 Whether you're working with printed, audio, e-books — or a combination of all three; All My Books has exactly what you need to catalogue your entire collection! Forgot who you lent that Harry Potter book to? Curious how many Stephen King books you've read? Interested in organizing your collection based on genre? Now you can with All My Books! If you've ever imagined how cool it would be to have access to a book cataloging program as powerful as your local library, there's no need to wonder anymore. Take your private collection to the next level through familiar functionality and dozens of fun features. Rediscover how fun it can be to collect books! At first glance, archiving your entire collection might seem a bit overwhelming. That's the thing though, it doesn't need to be. With All My Books, all you need to create a new book reference is title, author name, or ISBN number! Plug in any one of those three pieces of information, and AMB handles the rest by loading information gathered from online sources. Select your book from the list of results and the description, book cover... everything you'd ever want to know about that book is added to your personal AMB database. Scans hard drive for book files; users can choose to add files individually or in batch (multiples). 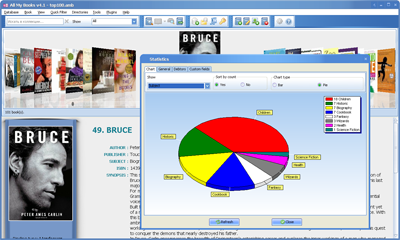 Auto-populate information about your books; plot, synopsis, reviews, cover graphics and more. Access 12 different international book databases to collect information about your collection. Add your own information; thoughts, musings, illustrations AMB is fully customizable. Toggle book details on/off to alternate between robust and streamlined views. More than a dozen custom templates let you define AMB’s appearance. Monitor where your books are currently across multiple locations. Sort and group books based on various criteria of your own choosing. Track which books you have already read, and which books you have yet to read. Create custom directories to help organize your collection. Generate powerful analytics and statistics related to your collection. Search for any book automatically by entering its ISBN number. Transfer books to your mobile devices; AMB is compatible with iPhone and iPad. Import existing book lists in TEXT or EXCEL format. Export data about your collection to EXCEL, HTML, PDF and more! Create and print documents related to different aspects of your collection. Secure your collection with password functionality. 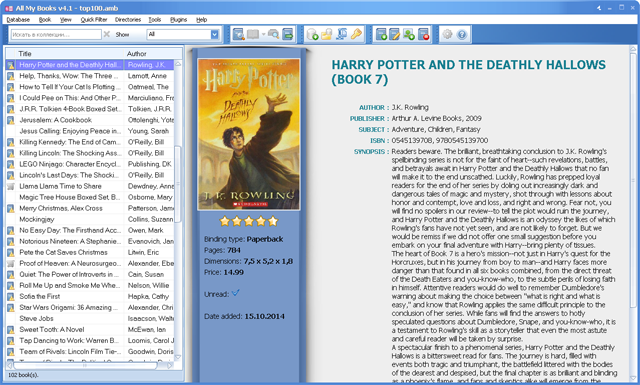 Supports e-books by storing associated links in the book card. AMB is compatible with Acrobat Reader, Sony Reader, Kindle, Rocketbook and all popular e-book formats. 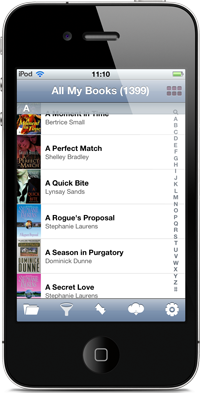 Supports playback of Audiobook files stored in the book card. AMB is able to playback MP3, WMA, M4A, Audible (AA, AAX) and OGG formats. 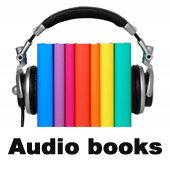 Learn more about Audiobook Collections. See for yourself what an amazing cataloging utility All My Books can be through our free 30 day trial download. HTML exports are limited, and you won't be able to create a new database with the free version, but you're welcome to work with the sample DB provided. If you like what you see and decide to buy a copy, you can take advantage of one of our special offers. If you're already using one of our competitors' book collection programs, we'll give you a 25% discount off the total price when you choose to switch to All My Books! Are you a blogger? Post an All My Books review to your blog and we'll provide you with a license for free. 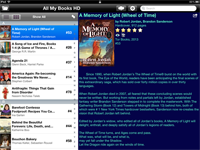 Yes, we made these apps for you to get even better experience with All My Books. Enjoy! 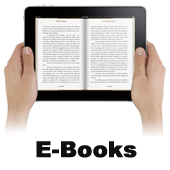 The Ebook Catalog Software You've Been Waiting For! Keeping Track of the Books Has Never Been More Fun!